The CBRM Solid Waste Department reminds residents there will be NO Curbside Collection on Good Friday, April 19, 2019. • EXTRA garbage bags and green cart material will be collected on your area’s next regularly scheduled collection day. • Blue bags will be collected on your area’s next regularly scheduled blue bag collection week. ALL CBRM Solid Waste Management sites including the Administration Office will be closed on Good Friday, April 19. 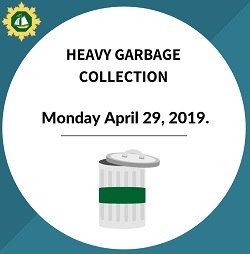 CBRM Solid Waste Department's municipal wide Residential Heavy Garbage Collection is MONDAY, April 29, 2019. Residents living at properties eligible for curbside collection must have their large, heavy or bulky household items placed at the curb no later than 6am on Monday, April 29. For more information, residents are encouraged to contact the Waste Management Hotline at (902) 567-1337 or visit the section on Heavy Garbage Collection. During the winter months, high winds and blustery weather conditions will make it difficult to secure collection materials safely and properly curbside. If a weather forecast is predicting unfavorable conditions and it is your collection day, residents are reminded they can hold on to their materials until their next scheduled collection day. • Extra garbage bags and green cart material on your area’s next regularly scheduled garbage and green cart collection day. The Blue Bag collection schedule for CBRM follows a 2 week collection rotation across the municipality. To determine if your area's blue bag collection week is during a GRAY WEEK OR WHITE WEEK, please fill in your civic address in the fields above. Please remember, Blue Bags are collected every second week on your area's scheduled collection day. The Solid Waste Department will post important Curbside Collection NOTICES, UPDATES or CANCELLATIONS in the section titled Curbside Collection Notices/Cancellations and in the section titled Solid Waste News. Collection information will also be posted using Social Media or by pressing Option #2 available when you contact the Solid Waste Management Hotline at (902) 567-1337. Monday collection is moved to Saturday. Click here for new calendar. You are also encouraged to phone the Solid Waste Management Hotline at (902) 567-1337. The weekly seasonal leaf and yard drop-off sites that operate one day a week in North Sydney, Glace Bay and New Waterford are closed for the season. The sites will re-open mid-May 2019. Residents are reminded leaf and yard waste can be dropped of year-round at the Waste Management Facility on SPAR Road from 8am to 4pm Tuesday to Saturday. Disclaimer: The information provided is based on our current records and we do not accept responsibility if the information is incorrect.